Despite the understanding that football is a team game, fans still have their favorite or preferred individual players. In a sense the coaches pick favorites as well, because at some point they have to name the starters. Essentially, the starters are those players the coaches feel will execute their assignments better than anyone else at that position. The last two seasons there has hardly been a battle for the starting quarterback position, as anyone remotely familiar with Oregon football knew that job belonged to Marcus Mariota. The primary concern among Oregon fans at the quarterback position was whether Mariota would make it through the season without injury. I expect a much different level of interest this year. With the current competition during spring practices, and the arrival of Vernon Adams in August, the position certainly has a new level of intrigue. Among the quarterbacks on the roster, the Ducks are short on game experience, but long on talent, numbers, and desire. Despite this inexperience at a key position, I expect very positive results for the Ducks come game days this fall. 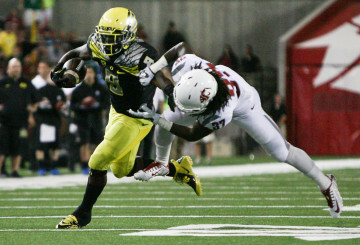 In successive seasons Byron Marshall was Oregon’s leading rusher and leading receiver. This did not happen overnight, but built slowly through the annual recruiting effort followed by exceptional coaching. While I believe Mike Bellotti deserves far more credit than he is often given, there is no question that Chip Kelly took the program to the next level and Mark Helfrich has continued the status quo. Looking around the country, the elite programs all have two things in common: talent and depth. For example, how many teams boast Ohio State’s quarterback talent and depth? It would be safe to say Oregon has a similar situation at running back: Royce Freeman, Thomas Tyner, and redshirt freshman Tony Brooks-James, who is turning heads this spring. 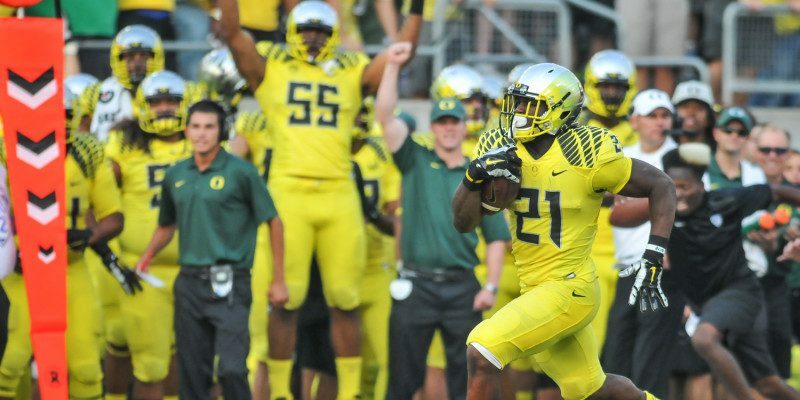 The Ducks are so deep at running back that their leading rusher from 2013, Byron Marshall, was moved to receiver. The same goes for wide receiver, where Oregon is so deep it could afford to move freshman phenom Charles Nelson to defensive back. 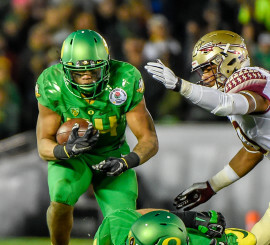 Thomas Tyner returns as part of Oregon’s tremendous depth and experience at running back. Many times during the “old days” I watched and hoped for Oregon’s “star players” to come through with a great performance in order to ensure the team had its best chance to win. When was the last time you were even slightly concerned that a certain player was “held to” a certain number of yards, carries, or catches? It does not seem to matter now. The Ducks have “star players” all over the field. The well-known “hockey line change” approach to the rotation of players gives traditional second and third stringers valuable game experience. In turn this makes recruiting easier because talented prospects know they are going to have a chance to play, despite the tremendous talent already in place on campus. Over time, the depth continues to expand and improve, and the Oregon system of “football by committee” keeps refueling itself for continued success.